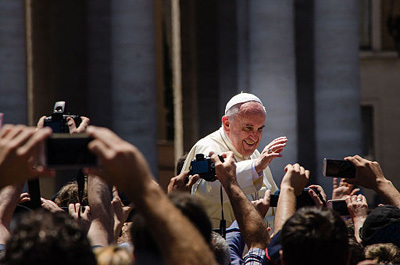 Seeing the Pope in person is rare for most people, but your opportunity has arrived! Pope Francis is visiting Philadelphia on the weekend of Saturday, September 26th and Sunday, September 27th. Here's what you need to know as you plan your trip to see the Pope in Philadelphia, and to visit other amazing Philadelphia attractions. Pope Francis will be doing a papal Mass on Sunday, which is open to the public and is expected to bring over 1.5 million people into the city center. Transportation will be the most important step to figure out as a number of major highways, along with the Ben Franklin bridge, will close during Pope Francis' visit to Philadelphia. Don't even think about trying to drive around Center City as no cars will be allowed to enter specific zones, which are outlined below. As a result, the best plan for travel is to plan to park outside the restricted area and bike or walk in or to obtain mass transit passes. Act fast: SEPTA had a lottery for special $10 three-day passes valid for Saturday – Monday for travel on subways, buses, and trolleys, which has already ended. You may also use a regular weekly/monthly SEPTA pass or TrailPass, One Day Convenience Pass, One Day Individual or Family Independence Pass, or Senior Fare, but all passes must be purchased in advance as sales offices will not be open, Ticket Vending Machines will not be in service, and cash will not be accepted on Saturday and Sunday. Regional Rail will only have daily passes available, which will be $10 a day, and must be ordered in advance. Only 18 of the 282 rail stations will be open over the weekend for travel into Center City. Drop off locations are listed on a special SEPTA site about the event. The ticket you receive will be stamped with the station name and will only be accepted at that station. Arranging to be dropped off and picked up at the station will be essential, as the amount of parking available will not meet demand. PATCO will also offer transportation from four of its New Jersey stations and one Philadelphia station. NJ Transit and Amtrak will also be making arrangements in the area. Visit the websites of these transit operators for more details. 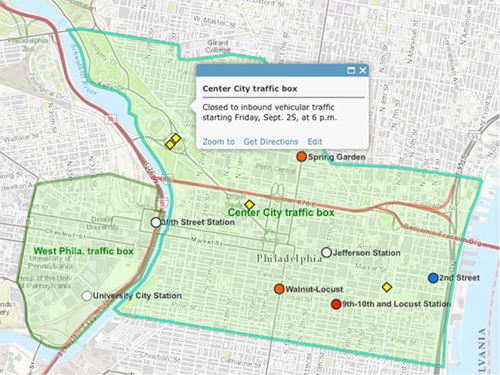 Map shows road restrictions, transit stations that will remain open during the papal visit, and locations at which Pope Francis will hold events. Keep in mind that camping out the day before the Mass will not be allowed by Philadelphia authorities. Selfie sticks will also be banned from the event. There will be no tickets required to view the Mass on Benjamin Franklin Parkway, so don't get duped by scalpers. Pope Francis' address at Independence hall will have some ticketed areas, and other areas available to the public. Food and beverages are OK. Bags may be subject to size restrictions. The U.S. Secret Service will spell out all the restrictions in early September. Also vendors will be set up all along the parkway. Food trucks will also provide a variety of cuisines and Philly Favorites. No alcohol will be sold. There will be more than 3,000 portable toilets on the parkway (including ADA accessible toilets). The Pope's visit has been declared a National Security Special Event (NSSE), which means that the United States Secret Service is the lead agency responsible for security. This designation is only in effect for the weekend of the papal visit, not the entire week of the World Meeting of Families, but does mean enhanced security measures will be in place. Mail collection and delivery will resume on Monday September 28 for all residents. If you're planning to have anything shipped to or from Philadelphia during this period, including the week before during the World Meeting of Families, expect Post Office locations to be closed and delivery delays. Certain areas where Pope Francis will be addressing the public will be blocked off to non-ticket holders. If you were one of the lucky people who reserved a ticket during the few seconds they were available, congratulations! Get there early for the best viewing spot. If you were not able to reserve your ticket, there are still several ways to see the Pope's address. On a jumbotron: The City of Philadelphia is providing 40 jumbotrons to project the Pope's message to the masses, including those who will be outside of the ticketed areas. You'll still be able to see and hear the Pope's message (which will be given in Spanish) even if you're blocks away from the address. There are several near the Independence Hall stage, along Benjamin Franklin Parkway, and at multiple other locations along what officials are calling a "block party" layout. On a parade route: Pope Francis is participating in two parades on Benjamin Franklin Parkway, one on Saturday and one on Sunday. This will allow people to get a much closer view of the Pope as he travels in his Popemobile. From your hotel: There are still hotel rooms available! Hotels are all but rolling out the red carpet for visitors, with many providing incentives such as transit passes and pope swag, and if you book a room with a balcony or window you can look down on crowds and watch a jumbotron or the live broadcast from your hotel TV. If you haven't already booked a room, you may need to check several hotels before you find one that has rooms still available. Also, be aware that many hotels raise their rates around a major event like this one, so don't be alarmed by prices. At the time of this writing, the hotels in or near city center that still had rooms were around $400 - $550 per night on the weekend of the Pope's visit. Hotels 10 or more miles from city center were in the $180 - $225 per night range. Using booking sites with reviews such as TripAdvisor, Booking.com, or Hotels.com is recommended in addition to AirBnB options. There are a number of amazing restaurants in Philadelphia that you will want to visit during your stay. For lunch, Sketch Burger is a must-have Philly classic. Don't miss the Harissa Aioli for dipping. For lunch or dinner, Radicchio has amazing Italian fair that's highly recommended. If barbecue is more your style, be sure to visit Fette Sau, which features indoor/outdoor seating, naturally raised meats, and amazing barbecue side dishes. When you're done with your meal, don't miss The Franklin Fountain for dessert. It's nationally known for its amazing ice cream blends. Find open restaurants either by walking by or using the hashtag #OpenInPHL for places that will be open during the weekend. You may want to scope out some spots beforehand, as cellular signals could be weakened with so many people in the same small area. While seeing Pope Francis is certainly exciting, there are many other attractions in the city of Philadelphia that will help you finish out your vacation well. Here are some suggestions. If you haven't seen the Liberty Bell before, it's a must-hit attraction in Philadelphia. It may be crowded with so many other people in the city, so be patient. The Liberty Bell Center at Independence Hall has a wealth of artifacts from the early history of the United States. The Franklin Institute has three floors of exhibits, including The Giant Heart, Changing Earth, and Your Brain. There are also live science shows and a Planetarium. Fun for all ages! After telling the kids to be quiet, sit still, and keep their hands to themselves for a few days why not take them to the Please Touch Museum®? Located at Memorial Hall in Fairmount Park, the museum has been recognized as one of the nation's top 10 children's museums. They'll love the fun and freedom! If you're looking for a more adult-focused attraction, the Eastern State Penitentiary is a fascinating place to visit. The prison was known for its grand architecture and strict discipline. Tours include Al Capone's cell, Death Row, and artist's installations. Seeing a Pope is a once-in-a-lifetime event for many people. As you plan to visit Philadelphia for the papal visit, be sure to purchase transportation passes in advance and be aware of street and station closures. After you've attended the Mass, stick around — there are lots of other fun things to do in Philadelphia. You'll have a fantastic vacation!